Imports or made in America – which is a better way to go? This is one of the questions people have about the patio swings. Nowadays a lot of imported swings are available online. This gives you many more styles to pick from, and a lower pricing on most products, but you have to be careful with quality cause the quality of products imported from overseas can often vary significantly. Just by looking at it, you can see a big difference in size of the frame logs. The logs used for the China Swing are smaller in diameter (3 inches) compared to the cedar logs used for the USA made swing which is about 5 inches in diameter. The logs for China swing go from the 3,2 inches big on the bottom to a little bit smaller 2,8 inches on the top. The American made log swing has a consistent diameter of 5 inches from top to bottom. American Swing: contoured for comfort. Imported Swing: Not cedar & not oak. Seems to be a light wood. Maybe birch. Creeks a little bit rough. Here you can watch a very informative and detailed comparison video. 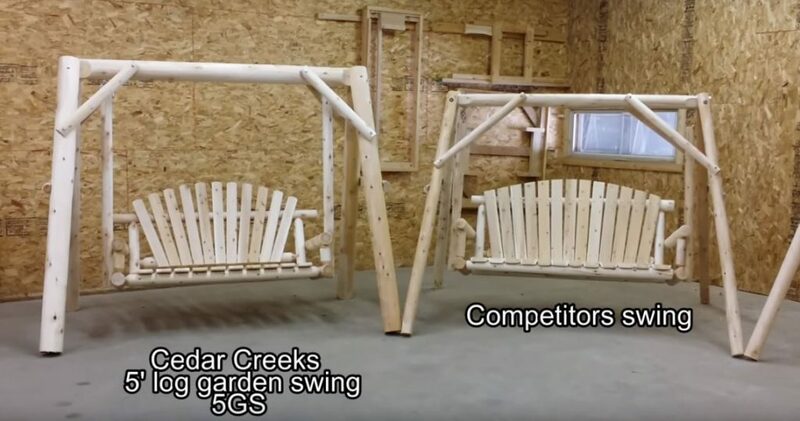 Cedar Log Swing Comparison Video from Cedar Creek Rustic Furniture. Please note that the video is from 2015 and some features changed. For example, now both of swings have eyebolts & S-hooks, which is not the case in the video where a custom-made U-bolt was used. In addition, if you look at the back and braces there is no big difference now between these two swings. The swing that costs less may, in fact, cost more. In our opinion, a cedar (especially white cedar) swing is always better, safer and in this case more comfortable than an imported swing. Moreover, it will last much longer.